Analyze and defragmenter your hard drive for faster disk access. Over time your hard drive can suffer from disk fragmentation where the physical data on your drive becomes jumbled and disorganized. Defragmenting will resort all the data into an organized state for faster disk performance. My Defragmenter is scheduled to run automatically once you install My Faster PC. The default settings schedule My Defragmenter to run every three months when your computer shuts down. To run My Defragmenter manually, just click the "Open My Defragmenter" button and click "Analyze" or "Repair" for on-demand defrags. You can also change the scheduler to run at different intervals, during startup or shut down, or not at all inside My Defragmenter. Please note: Defragmentation cannot be undone and may take 15-60 minutes to complete. How often should I defragment? 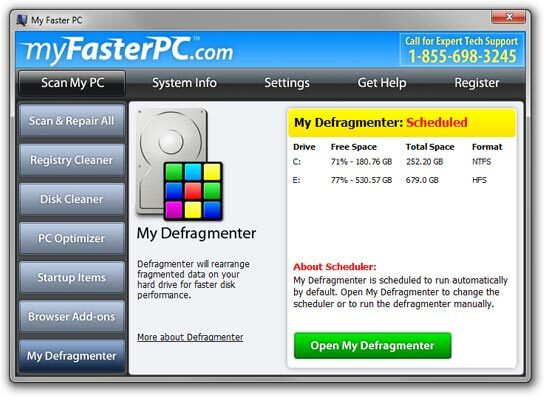 For most users, defragmenting your hard drive several times a year is probably sufficient (we recommend quarterly). If you work with large files (such as digital video) or frequently add or remove files, you may benefit from defragmenting more often. File fragmentation means the data that makes up a file is stored in non-contiguous locations on the hard drive. Over time files can become fragmented as data is added, deleted, and moved around. This can slow down access times for files and hinder hard drive performance. For a visual analogy, imagine you're trying to read a magazine, except half the magazine is in the kitchen and the other half is in the living room. You would have to move from the kitchen to the living room when you wanted to read that half. Defragmenting your files would join both halves of the magazine and store them in one room.